When looking at the list of published posts, I can see that my blog is virtually a hotchpotch of ELT-related stuff. Although I don't 'specialize' in one particular area, I've recently come to realize that quite a few of my posts revolve about writing. That's why I've decided to organize my scattered ideas into one coherent post. However, this is by no means a summary or a how-to type of post. I consider this to be a reflection with bits of revision and lots of extension. Before I launched this blog, I didn't really bother about writing very much. More precisely, I didn't incorporate writing practice into my teaching as much as I should have. I think it was because I didn't fully appreciate its potential. It was after I started writing in a foreign language when I realized how difficult it can actually be at times. And it got me thinking; it made me ponder ways of applying my personal experience to my teaching context. After a year of publishing in English, I've come to believe that through regular writing practice L2 learners will improve the target language in many different areas. First, they'll learn to work with various types of paper and online dictionaries. Also, as I described in one of my previous posts, the dreaded corpora can finally become invaluable allies in the process of language learning. 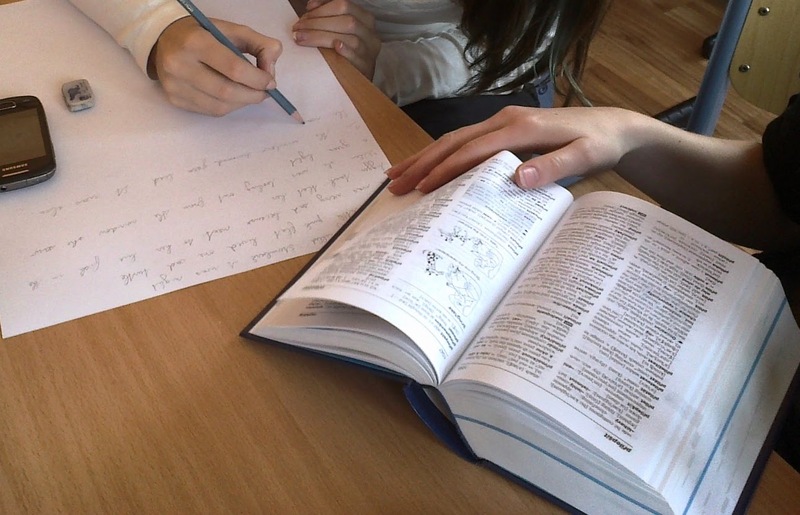 The constant need for synonyms, antonyms and other alternative ways of expression will direct the learner to online tools such as Synonym Finder or Thesaurus.com. Apart from the words they searched, they will come across many they didn't originally look for and thus incidentally learn lots of new vocabulary. In order to express ideas clearly and succinctly, the learner will inevitably need to think about grammar issues. An incorrect use of comma in a relative clause or wrong word order can complicate the message or can even hinder understanding. In addition, learners will occasionally have to think about the differences between L1 and L2. L1 interference is clearly evident in inappropriate choices of collocates. Google with its auto-complete device comes in handy but I find collocation dictionaries are much safer. Another area which improves dramatically through lots of writing practice is, quite obviously, spelling. However, by having to write a word down and use it in a specific context, the learner is made to zoom in on every aspect of the given vocabulary item; not just its correct spelling. If it's a noun, does it require a definite, indefinite or zero article? Is it countable or uncountable; what is the appropriate quantifier? If it's the past tense of a verb, is it regular, irregular or can it be both? Is it an absolute adjective? Here grammar, vocabulary and spelling overlap quiet a deal, which is only to the good. The degree of formality will become a useful concept as well. Unfortunately this is not a popular topic, at least in general English courses I've experienced. Yet whenever one is deciding which word to use, they need to take formality into account, depending on the style and purpose of the writing. Good dictionaries will be helpful in such a situation. This brings me to the frequency issue, another neglected area of English teaching. When producing a more advanced piece of writing, it's sometimes desirable to use a low frequency word instead of its more frequent alternative. L2 learners often lack the native speaker intuitions which would help them judge which word is more appropriate. Luckily, they can find information about frequency in Longman Communication 3000, or in any recent edition of a paper dictionary. More advanced learners can turn to corpora if they have been instructed how to use them. For academic writing purposes it's good to be familiar with the Academic Vocabulary List and have it constantly at one's disposal. I think it's a great bonus if somebody reads what the learner produces and responds to it in some way, be it the teacher or a classmate. This will lead to the need for even more clarity. One simply has to keep the reader in mind all the time when writing for an audience. The use of figurative language is an efficient way to spice up the learner's writing, but it can cause all sorts of misunderstanding, especially if the reader and the writer don't share the same mother tongue or if they're not on the same wavelength. Moreover, it's not easy to find an appropriate idiom, simile or metaphor because these are often expressed in totally different ways in L1 and L2. It's proved useful for me to keep a separate record of figurative language items and store them online, such as on Quizlet. I don't have a bi-lingual dictionary of idioms so when looking for an L2 alternative of an L1 idiom, for instance, I search it via the key word or sometimes I simply type in the precise English translation of a Czech idiom in the Google search box and it usually comes up with the correct English version (hat down would be the direct translation of hats off, so if I type in hat down, Google automatically comes up with hats off). This is a kind of trial and error procedure but it's fun and some incidental learning may happen along the way. Finally, due to the ambition to become more and more proficient, the learner will automatically want to study the style of other writers and thus will deliberately or incidentally adopt some useful expressions and techniques. It is a lot of quality input one needs in order to create quality output after all. Good writing obviously involves more than just correct grammar and extensive vocabulary, but these are the stepping stones to success and subsequent increase in motivation. Writing can bring a satisfying and exhilarating feeling of creative accomplishment and I believe this can ultimately lead to noticeable language development. Why not bring this virtuous circle to the language classroom and exploit it to the full?